It’s almost holiday time and there are tons of great films this November. For after Halloween fall scares, check out the creepiest film I have ever seen The Killing of the Sacred Deer, which opened wide on November 3rd. Bad Moms 2 and Daddy’s Home 2 bring great comic relief to the stressful holiday season. Thor: Ragonok and The Justice League are both great, although I much preferred the former. On the indie side, Sweet Virginia is a great film noir and Three Billboards in Ebbing, Missouri is a very dark comedy. And finally, Darkest Hour is a must-see with Gary Oldman, a shoo-in for Best Actor at both the Globes and the Oscars. I made the mistake of going to a late screening of this. See this in the day because it is, quite frankly, the creepiest film I have ever seen! Equal parts eerie and equal parts disturbing, this movie will stay with you forever after. Shot beautifully, wonderfully acted, with a crazy scary plot and a jarring soundtrack – this a masterpiece in psychological horror. In fact, it is now one of my top horror films of all time. Plot Summary: Dr. Steven Murphy is a renowned cardiovascular surgeon who presides over a spotless household with his wife and two children. Lurking at the margins of his idyllic suburban existence is Martin, a fatherless teen who insinuates himself into the doctor’s life in gradually unsettling ways. Soon, the full scope of Martin’s intent becomes menacingly clear when he confronts Steven with a long-forgotten transgression that will shatter his domestic bliss forever. I am a huge Avengers fan plus anything with Chris, the hunkiest of the Helmsworth brothers, is a must-see. It’s hilarious and fun and everything we have come to love in Marvel films. I am thrilled to see it’s directed by Taika Waititi, which makes for a rare person of color in the comic action, director’s seat. 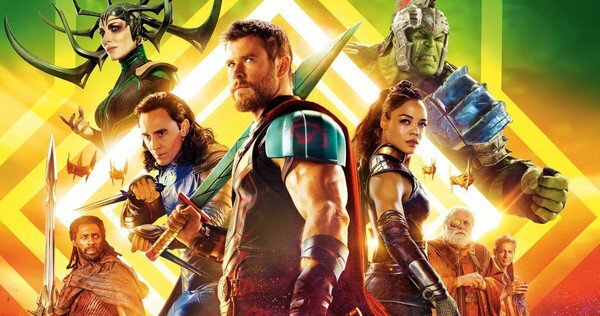 Plot Summary: Imprisoned on the other side of the universe, the mighty Thor finds himself in a deadly gladiatorial contest that pits him against the Hulk, his former ally and fellow Avenger. Thor’s quest for survival leads him in a race against time to prevent the all-powerful Hela from destroying his home world and the Asgardian civilization. The second, in the hilarious blockbuster hit series, finds our Moms struggling with all the added Mommy duties that the holidays always bring. When their own Moms show up, it is double the work but double the loving fun. Plot Summary: Under-appreciated and overburdened moms Amy, Kiki and Carla rebel against the challenges and expectations of the Super Bowl for moms: Christmas. As if creating the perfect holiday for their families isn’t hard enough, they’ll have to do it while hosting and entertaining their own respective mothers when they come to visit. I saw this at this year’s NYFF and it is one of the most heartfelt films ever made about vets and their experiences. Steve Carrell is one of the finest actors of our generation and paired with Fishburne and Cranston, this vet road trip film is another instant classic from Richard Linklater. Take the vet in your life. Plot Summary: Thirty years after serving together in the Vietnam War, Larry “Doc” Shepherd, Sal Nealon and the Rev. Richard Mueller reunite for a different type of mission: to bury Doc’s son, a young Marine killed in Iraq. Forgoing burial at Arlington National Cemetery, Doc and his old buddies take the casket on a bittersweet trip up the coast to New Hampshire. Along the way, the three men find themselves reminiscing and coming to terms with the shared memories of a war that continues to shape their lives. One of the best films of the year, Lady Bird is poignant, funny, sad, and uplifting all at the same time. Saoirse Ronan shines in the lead, creating a film teen that will be remembered for generations. But Laurie Metcalf steals the film, turning in an Oscar-worthy performance, as Lady Bird’s tough mom. It is a little longer than it needed to be, otherwise it is an amazing film. Plot Summary: Marion McPherson, a California nurse, works tirelessly to keep her family afloat after her husband loses his job. She also maintains a turbulent bond with a teenage daughter who is just like her — loving, strong-willed and deeply opinionated. With the topic of immigration on all of our minds, Most Beautiful Island is a timely look at the trials that immigrants face in America. Plot Summary: A psychological thriller set in the world of undocumented female immigrants hoping to make a life in New York City. Shot on Super 16mm with an intimate, voyeuristic sensibility, Most Beautiful Island chronicles one harrowing day in the life of Luciana, a young immigrant woman struggling to make ends meet while striving to escape her past. As Luciana’s day unfolds, she is whisked, physically and emotionally, through a series of troublesome and unforeseeable extremes. Crazy for both Agatha Christie and Kenneth Branagh, this film was top of my fall list. Branagh’s direction is always breathtaking and the film is shot beautifully. But I found his portrayal of Poirot, a bit too campy and self congratulatory, which was an unusual take on the character. Truly intelligent people never continually blow their own horns. This was Poirot for the Trump era. thus I was slightly disappointed. That said, it’s still a must-see. Plot Summary: A lavish trip through Europe quickly unfolds into a race against time to solve a murder aboard a train. When an avalanche stops the Orient Express dead in its tracks, the world’s greatest detective — Hercule Poirot — arrives to interrogate all passengers and search for clues before the killer can strike again. I loved the first one and this one is just as funny. The introduction of Mel Gibson and John Lithgow, as Wahlberg and Ferrell’s very different dads, adds an extra layer of hilarity. Plot Summary: Father and stepfather Dusty and Brad join forces to make Christmastime perfect for the children. Their newfound partnership soon gets put to the test when Dusty’s old-school, macho dad and Brad’s gentle father arrive to turn the holiday upside down. After a sudden change in plans, the four men decide to take the kids to a luxury resort for a fun-filled getaway that turns into a hilariously chaotic adventure. An all-star cast makes this dark comedy a must-see. Since Fargo, I never miss anything with Frances McDormand…ever! Plot Summary: After months have passed without a culprit in her daughter’s murder case, Mildred Hayes makes a bold move, painting three signs leading into her town with a controversial message directed at William Willoughby, the town’s revered chief of police. When his second-in-command, Officer Dixon — an immature mother’s boy with a penchant for violence — gets involved, the battle is only exacerbated. DC Comics has always been less glossy than Marvel for me. This film, while good, didn’t knock it out of the park, like The Avengers or X-Men. The problem is twofold. First, the villain is a bit silly. In addition, after Christian Bale‘s amazing portrayal of Batman in the Dark Knight series, Ben Affleck was a horrible choice for the role. He phones his performance in like a zombie. Fortunately, Gal Gadot is perfect as Wonder Woman and saves the whole film. Plot Summary: Fueled by his restored faith in humanity and inspired by Superman’s selfless act, Bruce Wayne enlists newfound ally Diana Prince to face an even greater threat. Together, Batman and Wonder Woman work quickly to recruit a team to stand against this newly awakened enemy. Despite the formation of an unprecedented league of heroes — Batman, Wonder Woman, Aquaman, Cyborg and the Flash — it may be too late to save the planet from an assault of catastrophic proportions. The darling of this year’s Sundance and the NYFF, Mudbound is a deeply profound look at race and class in post WWII America. This movie struck a real chord with me. My Dad is a WWII vet and my late uncle Mitch was a Tuskegee Airman. Yet as black men, they had to face the PTSD of war coupled with the horrors of twenty more years of American segregation once they returned home. Imagine risking your life for a country that might take it when you got home. For black American soldiers, there have always been three war zones – the actual war, the war of the mind that PTSD cause and the battle for equality at home. This is one of the best films of the year with riveting performances from the entire cast including Carey Mulligan, Jason Mitchell, Jason Clarke, Garrett Hedlund, and Mary J. Blige. Dan Gilroy‘s “Nightcrawler” was a surprise hit and featured one of the best performances of Jake Gyllenhal‘s career. Thus, I was excited about his latest film and it definitely delivered. With Academy Award winner, Denzel Washington, in a riveting performance as a civil rights lawyer, this film is just as good. Plot Summary: Roman J. Israel is an idealistic defense attorney whose life gets upended when his boss and mentor — the legendary civil rights icon William Henry Jackson — dies unexpectedly. He’s then recruited to join a law firm led by George Pierce, an ambitious lawyer who was one of Jackson’s former students. Israel’s legacy of activism soon gets put to the test when he takes on the case of Langston Bailey, a young man accused of murdering a convenience store clerk. I love noir both classic and contemporary. With Jon Bernthal of “The Walking Dead” fame and Imogen Potts, this twisty thriller is the perfect movie for lovers of the genre. Plot Summary: An ex-rodeo rider strikes up a friendship with a young man who may be behind the violence occurring in their small town. This film is the must-see of the month. Originally slated for January 2018, it was fortunately moved up to this month seemingly for this year’s Oscar consideration. Gary Oldman should be a shoo-in for a Best Actor, as he is riveting and literally becomes Winston Churchill! There was no semblance of Gary Oldman left as he completely disappears into the role. I don’t even know who else can honestly be nominated in this category this year. Besides Steve Carrell, as Bobby Riggs in the “Battle of the Sexes”, there weren’t a whole bunch of other great male performances in 2017. Plus, there are no movies on my radar that will feature any before Oscar nominations. I love the director Joe Wright, who also brought my favorite version of “Anna Karenina” to the screen back in 2012. Run, see this. Plot Summary: The fate of Western Europe hangs on Winston Churchill in the early days of World War II. The newly appointed British prime minister must decide whether to negotiate with Hitler or fight on against incredible odds. During the next four weeks in 1940, Churchill cements his legacy as his courageous decisions and leadership help change the course of world history. Holiday fun for the whole family, The Man Who Invented Christmas takes a fresh look at the classic Scrooge tale by exploring the life of the man that created him – the legendary author, Charles Dickens. With Christopher Plummer and Dan Stevens of “Downton Abbey” fame, I skipped the press preview so I can make this my Thanksgiving Eve film. Plot Summary: Using real-life inspiration and a vivid imagination, author Charles Dickens brings Ebenezer Scrooge, Tiny Tim and other classic characters to life in “A Christmas Carol,” forever changing the holiday season into the celebration known today. I am so looking forward to this. An animated film set in Mexico with an all-star Hispanic cast, this is a sure winner. Plot Summary: Despite his family’s generations-old ban on music, young Miguel dreams of becoming an accomplished musician like his idol Ernesto de la Cruz. Desperate to prove his talent, Miguel finds himself in the stunning and colorful Land of the Dead. After meeting a charming trickster named Hector, the two new friends embark on an extraordinary journey to unlock the real story behind Miguel’s family history. Fun romantic comedy about living authentically and finding love in these social media controlled times. Plot Summary: Four middle-aged friends living in Los Angeles confront a new reality.